THI produces a straight-run in the “W” Beam (Profile A above) and “J” Beam in fibreglass. Both “W” and “J” are designed to be used with standard fittings designed for conventional steel, i.e., blocks, bolts, nuts and washers, reflector, cat's eye, and other relevant components. THI “W” and “J” Beams are designed to be used with steel fasteners and accessories. PRICES depend on volume and per unit lengths. SUBSTANTIAL DISCOUNTS for volume orders. Also known as Roadway Crash Barriers, Guiderail or W-beam. Highway Guardrail Barriers: Depending upon your site requirements, guardrail barriers can be easily configured for optimal performance and are cost efficient. Highway Guardrail Accessories are compatible. Highway Guardrail Beams: THI manufactures guardrail beams in Standard Lengths: 3.81m (12' 6") and 7.62m (25') lengths. 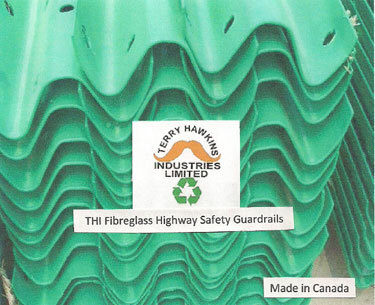 THI Guardrails equivalent to steel: FRP is equivalent to Steel Hot Dipped Galvanized: 1100 g/m2 (80µ) or 1200 g/m2 (85µ). Custom Guardrail Lengths: Available lengths customized according to your requirements. Since the material is lighter, THI Fiberglass Highway Safety Guardrails or “beams” can be produced in 25-foot sections, twice as long as typical steel beams. Bolts for traditional beams are replaced by a connecting rod and pin system, making installation faster and cheaper. Fiberglass guard rail installation costs are 15% to 20% per foot less than steel. Drivers probably give guardrails little thought, unless they're negotiating a hairpin curve or passing a steep drop-off. But about 15,000 people in the US die each year after their vehicles careen off the road, the FWHA reports, making roadside rails a crucial part of highway safety. Losses due to Steel Guardrail theft is a major problem avoided with fiberglass guardrails.